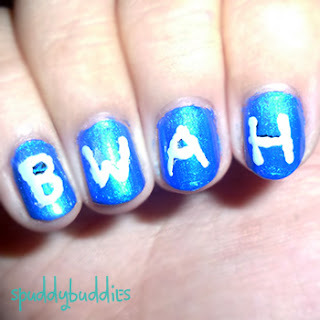 I probably have tons of people guessing what my display picture of these nails actually are. These are actually the four main characters of the popular post-apocalyptic online comic, Romantically Apocalyptic. I'll get to them in a bit. I did this for my sister who is an avid gamer and post-apocalyptic-related-stuff fan. She introduced Romantically Apocalyptic to me while I was in the US... since my return home, I regret to say that I haven't been keeping up with it regularly. But she loves it and keeps up with it - dare I say - religiously. I do adore the characters, specifically Mr. Snippy (who is probably ridiculously cute underneath that mask). I think they turned out the way I expected them to. Which is rare because sometimes I picture a design so perfectly in my head but the end result is disappointing. Oh, and I've only ever seen one other RA nail design so unless there are more out there hidden in the wasteland ruins of the Internet (hah, an RA reference! 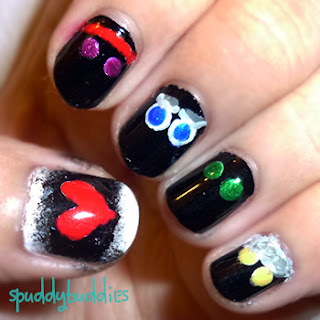 ), that would make my nail art one of the first few and rare RA designs. 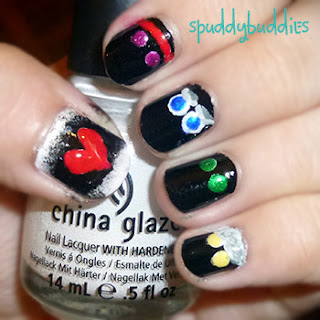 One of the quickest and most rewarding nail designs evar! Pointer: Orly - Liquid Vinyl, China Glaze - Salsa, nameless purple glitter polish. I did some polish mixing to get the right shade of color that I wanted and I used white polish as a base for all the eyes. I even added the fur coat over Engie's eyes even though as first I was tentative. I used white polish then flecked on different shades of gray to make a textured kind of look. It turned out okay. I could have done a bit of touch up but I was afraid I might mess it up so I just left it at that. BWAH?! 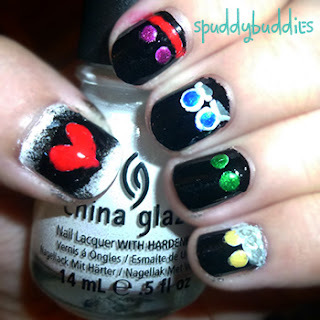 on my right hand nails. Mr. Snippy's trademark quote when he's surprised. I got my sister to help me make a black outline of the letters before I went over them with white. My sister loved them, yay! What do you think? Did I do Romantically Apocalyptic justice with these nails? If you're like my sister, go check out the comic over here and tell me what you think.